Writing my travel blog has rekindled my love for writing. When I was younger I would write stories all the time. My favorite was a story for my 5th grade English class; it was a story about a chicken who lived after having his head cut off. As real life began, I stopped writing. Nursing requires very little writing; on the contrary, we write in little fragmented sentences with abbreviations that only healthcare providers can understand. As I write more and more posts, I remember how much I like the art of describing my thoughts by carefully choosing the letters I put together to make the words that illustrate what I’m thinking. So when I saw the Creative Loafing fiction contest I figured, hey, why not, and wrote a short story. The only requirements were that it was based on something in Tampa and it was less than 3,000 words. My story didn’t make the top ten for them, but it did for me. I love this little story, so I thought I would share it. Let me know what you think. “Grandma, do we have to come here every time I go to your house?” Anabel whined while pulling on her grandma’s hand, hoping she could stop and play in the fountains by the river like the other kids. 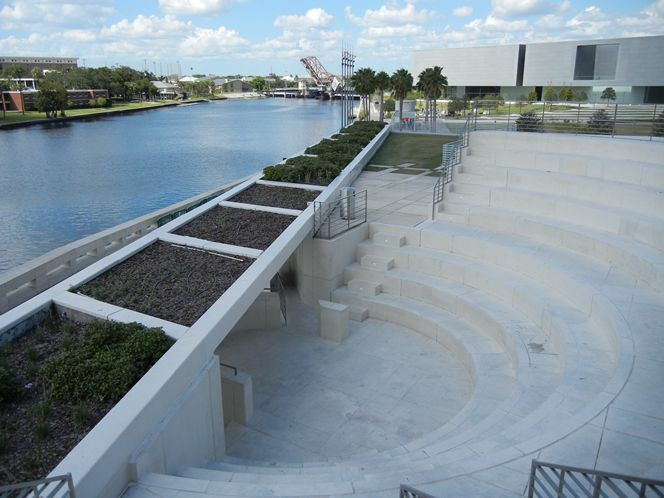 The green grass, the busy river full of dragon boats, and the ornate minarets of the University of Tampa usually drew the attention of visitors to Curtis Hixon Park. Busy parents, students, and young professionals were inspired to just sit and enjoy the sun on their face. But Anabel’s grandma, Maria, was oblivious to the beautiful sites, walking with determination right past the playing children. Maria held Anabel’s hand tight as she pulled her down the Riverwalk. Anabel studied her grandma as they walked through the short cement tunnel to the open amphitheater. The look of determination had left Maria’s face, and a look of sadness had taken over. This was a less flattering look on her, emphasizing every little nook and cranny that the stress of a hard life had left. The beauty of her younger years still came, although at 70 years old it was a little harder to find. “Grandma,” Anabel asked again, “do we really need to come here?” They swiftly climbed up the cement stairs to the top row of the little amphitheater. Maria still possessed the agility of the dancer that she was decades ago. As they sat down, Maria looked down towards the tiny center stage with decades of sadness in her eyes, and decided that Anabel, a mature 12 years old, was old enough to hear her story. “Well, Anabel, you know that I moved here from Cuba alone. But what you don’t know is why I came here in the first place.” With that, Maria sighed, closed her eyes, and thought back 55 years. It was a difficult time in Cuba, but she had no idea just how difficult it had become. Maria was a carefree 15 year-old, an only child to a baker. Her family was not well off by any means, but her father made a decent living at the bakery, and it was enough for a roof over their heads and plenty of food for the little family of three. Maria and her mother, Benita, would help in the bakery every chance they could get. Benita would run the register and Maria would dance around, cleaning up flour and tidying up the few small tables set out for patrons to sit and enjoy their baked goods. Maria loved to dance, loved the sight of her flowing, colorful skirt as it billowed through the air. Sometimes, a cloud of flour would float through the kitchen door, and Maria would dance as it fell on her head, pretending she was a princess in a faraway country, dancing in the snow. Maria first noticed Alcides in the bakery on one of the rare, glorious days when her father was ferociously baking in the kitchen and soft, white flour was constantly billowing out the kitchen door like a winter storm. Maria was happiest in these moments. She was dancing in circles with her eyes closed; breathing in the powdery flour and feeling it land on her skin, like tiny bits of clouds falling out of the sky. The only music she had was in her head and she opened her eyes as her imagination ran cold. There was a young man sitting on of the rickety old stools at the counter, staring at her, eyes wide. Maria stared back for just a moment, making eye contact with his velvety brown eyes. She felt her face getting warm and looked away. Maria took a deep breath and looked around. Both of her parents must be in the back, leaving her the only one there to take the staring boy’s order. Feeling embarrassed, she shuffled over to him, afraid to look back up, even when she got to the counter. “Would you like to order something?” she asked him, while staring down at the counter, eyes fixed on a stain that she never noticed before. “Yes, ballerina, I would like a guava pastelito and a date with you,” he stated in such a matter of fact way that Maria was sure he must say that to every girl he meets. Maria was too embarrassed to respond, so she just headed to the pastry shelf. She reached over the counter to hand him the pastelito but instead of taking the pastry, he put his hand over hers. She looked up at him, surprised, and he said, “My name is Alcides and I’m going to marry you someday.” He dropped the change for the pasty on the counter, winked at Maria, and left. Alcides returned every day for nearly two weeks, ordering whatever pastry he saw first, and asking Maria for a date. And every day, Maria handed him the pastry without a word, and tried to look busy. Her parents would watch from the kitchen and quietly laugh at their daughter’s embarrassment. They knew of Alcides; his father owned the biggest cigar factory in town. They were a nice, respectable family and they were happy with the boy’s interest in their daughter. Every day Alcides would leave smiling, like he knew his time would come. But today was different. After Maria handed him the pastry he set it down on the counter, grabbed her hand, and said, “Tonight, ballerina, we are going dancing. I’ll pick you up here at 7.” He paid for his pastry, gave her the wink that made her belly feel like it was trembling and her knees go weak, and walked out the door. Later that evening, Maria spent hours getting ready. She anxiously tried on every dress she had, some of them twice. Her mother had attempted to calm Maria, but the more her mother said the more nervous Maria became. She decided there was no way she was going and put on her ratty old nightgown and sat on the floor, pouting. Benita quickly left the room and came back a few minutes later holding something tightly in her right hand. “My dear Maria,” she began, “I know exactly how you feel. My first date was with your father and I almost didn’t go. Just like Alcides, your father asked me every day for a date until he finally made the decision for me and told me we were going. I was so nervous that I decided that I would not go. Then my mother came in my room and brought this necklace with her. She told me that she wore it on her first date with my father and that I was going to wear it on my first date too.” Benita opened her hand to show Maria the beautiful golden necklace in her hand. The gems brought out the flecks of yellow in Maria’s brown eyes and the scalloped edges matched her favorite dress perfectly. Benita walked behind Maria and reached around her neck, placing the beautiful necklace around her neck. “Oh mama,” Maria said breathlessly, “it’s perfect.” Just the like two generations before Maria, the necklace was enough to encourage her to get dressed and head to the bakery to meet Alcides for her first date. Alcides was walking up to the front of the closed bakery at the same time Maria was arriving. Alcides looked so handsome in his white pants, so perfectly ironed that Maria was sure his mother must have helped him. His hat was tipped at just the right angle to show off his deep brown eyes and his mischievous personality. Alcides let out a low whistle and said, “Wow, Maria, you look gorgeous,” and gave her his little wink, the wink he saved only for Maria. His compliment and her confidence from the necklace were enough for Maria to let out the breath she didn’t realize she was holding, and she smiled. “Thank you, Alcides, and you look very handsome yourself,” she said, turning ever so slightly pink in the cheeks. It was the most she had ever said to him and it was all it took to break the ice. As they walked down the road towards the street dance, they never stopped talking once. When they finally arrived to the party they had dry throats from talking and aching bellies from laughing. They each grabbed a soda, took a long drink, and then headed to the street to dance. There were lights strung up above and they looked like little lights from heaven. Maria looked up as she was dancing with Alcides and was sure the lights were put there just to light the way for them. Maria had never had so much fun and couldn’t imagine ever being happier than she was in that moment. The band was playing her favorite song and the sweet smell of cigars and desserts were all around her. She would have thought that she had died and gone to heaven if it weren’t for Alcides stepping on her toes so often. Smooth talking Alcides wasn’t so smooth at all; later Maria learned that he left the bakery after every visit those first few weeks in a near panic, unable to breathe until he could no longer see the bakery sign. Every day after that Alcides would stop by the bakery near closing time and walk Maria, his ballerina, home. They talked about their families, their futures, their dreams. Maria had never felt so close to anyone in her whole life. Days turned to weeks, to months, and soon it was exactly one year since their first dance where they danced in the street. Alcides showed up at closing time just like he always did, only this time he was wearing his best suit and carrying a huge bouquet of flowers. Maria couldn’t believe how handsome Alcides, her Alcides, looked. She quickly removed her apron and tried to brush the remnants of the flour, left from helping her father bake, out of her hair. She headed in to the kitchen to tell her parents that she was leaving and saw a beautiful new dress hanging up; the necklace she wore on their first date beside it. Her parents were nowhere to be found, but there was a note next to the necklace. Happy anniversary, my dears. Have a nice time but don’t be home late. Love, Mom and Dad, the note read. Maria closed the note and held it to her chest. She kept her eyes closed tightly, thanking God for making her so happy and trying not to let the tears of happiness out. She took a deep breath and headed to the bathroom to change. She came out in her new dress and did a little twirl for Alcides. He smiled a wide, toothy smile, the kind that only a man in love will know. He helped Maria fasten her necklace and then stepped away, holding her at arm’s length. “You, my ballerina, are the vision of perfection.” He gave her a big hug and a light kiss on the cheek, and then offered his arm to her. She hooked her arm in his and they headed to the door. They walked down the street, talking nonstop. Maria wasn’t paying much attention to where they were going. She was just enjoying the moment with her Alcides when he stopped walking. Maria stopped talking and looked around. She realized they were in the exact spot where they danced in the street on their first date. She looked up and saw the lights hanging above her, just like their first date. She continued to stare with amazement, and she couldn’t believe their luck. She didn’t realize that the lights were put up just for her until she looked back at Alcides and saw he was down on one knee. Maria gasped, and the tears of happiness began flowing, the tears she had been holding back all night. “My ballerina,” Alcides began, his voice breaking. He cleared his throat, took a deep breath, and grabbed her hand. “My dear ballerina, Maria,” he began again, “I knew from the first moment that I saw you in the bakery that I loved you and I knew from the moment I saw you dancing in my arms on this street, under the lights, that I was going to spend the rest of my life with you. Maria, will you marry me?” Alcides pulled a small, delicate gold ring out of his pocket and held it out to her. Maria yelled, “Of course! Yes!” Alcides slid the ring on her finger, stood up, and gave her a long, passionate kiss, right in the street. A moment later, Maria heard clapping and opened her eyes to see their parents standing there. The moms were crying and dabbing their eyes, and even Maria’s father looked a little misty eyed. Alcides father, however, just stood there, staring. He was always a stiff man, dressed in a suit even on the weekend, and never showed much emotion. Maria started to worry, wondering if he approved of her, but then her mother ran over and hugged her and Maria forgot about Alcides’ father for the moment. The next few weeks were a whirlwind of wedding planning, working at the bakery, and finishing school. They planned on being married shortly after they graduated and starting their adult lives together. They talked late in to the night about the special cake her dad was baking, where they would live as a married couple, and how happy they were. To Maria’s father’s dismay, she did not want to learn to take over the bakery. Instead, she wanted to become a dancer. For over a year Alcides had taken her dancing twice a week and she had discovered she had quite the talent for her new passion. Alcides was already training to take over his father’s cigar factory. They were madly, deeply, in love and were planning a long future together. A week before the wedding Alcides rushed in to the bakery and it was obviously that he had been crying. He was talking so fast between hiccups and taking gulps of air that Maria couldn’t understand a word he was saying. “Alcides, slow down please. I can’t follow what you’re saying.” Maria led Alcides outside to talk while instructing him to take deep breaths, trying to calm him down. “Now, Alcides, what is wrong?” Maria asked in a quiet worried voice, knowing she would not like whatever news he was bringing. She quickly prayed that his parent were okay. They sat on the curb as Alcides began talking in a slow, deliberate tone. “Maria, we are leaving for America today. Now. My parents just told me to pack as little as possible and get ready to leave. They didn’t say why, they just said that we were leaving right now and that you can’t go with us.” With that, Alcides began crying so hard he could barely breathe. Maria just sat there in shock, unable to speak. She just sat there, staring, as Alcides cried next to her. “Maria, please say something. My parents are already on their way to the docks with our belongings and they expect me any minute. My ballerina, please say something. I love you so much,” he pleaded, as he began to cry harder. “Alcides, I will not live without you. I will follow you to America and we can start our life together there.” As she said this, she realized how impossible it would be for her to get to America, and she began to cry. Why did they have to leave? Why couldn’t Alcides stay in Cuba with her? They sat on the curb, holding each other and crying, until Alcides knew he couldn’t wait any longer to go meet his parents. “Ballerina, I need to go,” he whispered, his voice raw from crying. “When I get to America I will write you a letter every day until you come to meet me. I will build a stage just for you to dance on, so please practice hard. And please, please don’t forget me.” He hugged her one more time, so hard she thought she might burst, and then he got up and ran towards the dock, leaving her crying on the curb. Grandma Maria opened her eyes, looked at Anabel, and said, “And I never saw him again.” A lone tear ran down Maria’s face as she thought about watching Alcides run away from her, the last time she would ever see her love. “Why, grandma? Why didn’t you follow him here?” Anabel asked. “Oh my dear girl, it wasn’t that easy. My parents didn’t have enough money to leave Cuba and a young girl couldn’t make her way to America alone. Many years later I finally found my way to America and headed here to Tampa, because I heard there were a lot of Cuban families here. I never received a letter from him, but I knew he still loved me. When I finally arrived here I asked around about Alcides for months and months until I finally found a man that knew him. He looked at me and said, oh my goodness, the ballerina. Then he led me here, to the stage my Alcides had built for me.” Maria stopped and looked around, the grief obvious on her face. “But grandma, where was he?” Anabel asked. “Oh Anabel,” Maria said with a sigh, “he was gone. An accident had taken him from me. All I had left was this amphitheater in the park. I can still feel him here, especially when I’m dancing.” With that, Maria stood up, walked gracefully down the stairs to the stage and began to dance, a smile growing on her face. Anabel watched in amazement as her grandma danced and she knew the spirit of Alcides was dancing with her.